Professional referral service offered by Mark's Lawn Service, Inc.
ASAP BID is a FREE contractor referral service for Residential, Commercial, and Town Home Properties. We service the Twin Cities and surrounding areas. OUR GOAL is to connect our customers with quality contractors for the benefit of both the customer and the contractor. OUR PROMISE is to pare you with contractors that will best fit your needs, and are readily available upon request. We will do our absolute best to quickly connect you with contractors that can assist you right away. Our network includes contractors from all trades, so you can be sure to find a quality contractor for any type of project you may have...large or small. ASAP Bid is your one stop shop to finding the best contractors around. Referrals are the best way to find good reputable contractors, so don't waist your time...let ASAP Bid connect you with the right contractor for your project needs right away. No more getting that unsettlied feeling, where you feel the need to question whether or not the contractor you hired is right for you. Please let us help you out...you will not regret it one bit! 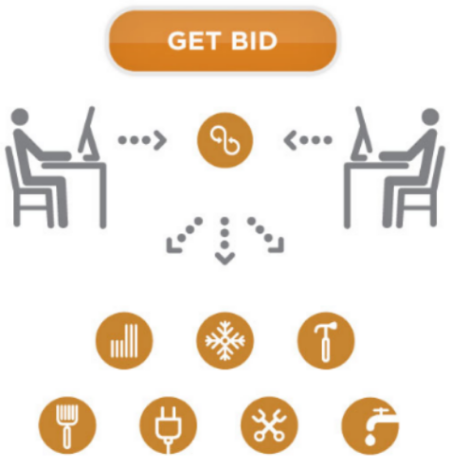 Click on Get Bid and fill out the form as detailed as possible in order to help us connect you with the best contractor that fits your project needs. ASAP Bid will contact the contractors that are suitable for your project. ASAP Bid will also forward you a Contractor Profile Form, so you can examine the credentials of the contractors yourself before hiring them. The contractor will contact you and schedule a meeting at your convenience within 48 hours. The contractor will submit a detailed bid for your project within 3 business days from the first time you meet.